“Jun a fa i 4 jûs?” This is the Ladin phrase we always use when we want to ride the loop now known as Sellaronda with friends. In fact, the term “Sellaronda” was only adopted in the late ’90s after the famous Sellaronda loops that you can ski during winter in the Dolomites. 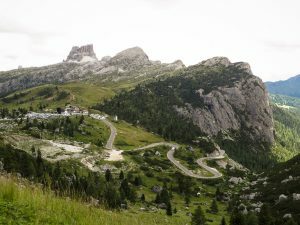 First used in cycling to describe the short course in the Maratona dles Dolomites, it’s now also a common term to describe the loop for cyclists around the Sella Massif. The translation of the above Ladin phrase would be “Should we ride the 4 Passes?” Of course, only locals understand its meaning, given that we are surrounded by Dolomite Passes and there are many loops you can ride that have exactly 4 climbs. The route that we describe here is one of them. It is suited to those of you who think the classic Sellaronda with (just) 66 km is too short, and want to add some extra km and elevation gain to their ride. Starting in Badia head south (uphill) on the SP244 towards Corvara. There is a fantastic cold water fountain to fill your bidons on the right side of the road. Be sure to fill up because there aren’t any water fountains along the road for quite some time (30 km). In Corvara, turn right following the signs to Passo Gardena. You’ll go through Corvara. 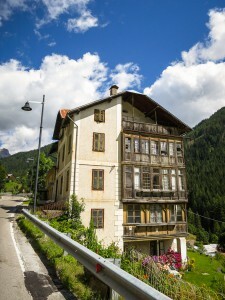 The climb starts towards the town of Colfosco and then heads on towards Passo Gardena. Welcome to the top of Passo Gardena! Enjoy the view of the Sassolungo! Put on a jacket and you’re ready to start the descent. You’re at the crossroads to Passo Sella, turn left. You’ve reached the second climb of the day! This is also the highest one, reaching 2,244 meters above sea level. There are two more climbs to go and the next one will come shortly after a nice descent. Now you are at the crossroads going towards Passo Pordoi. 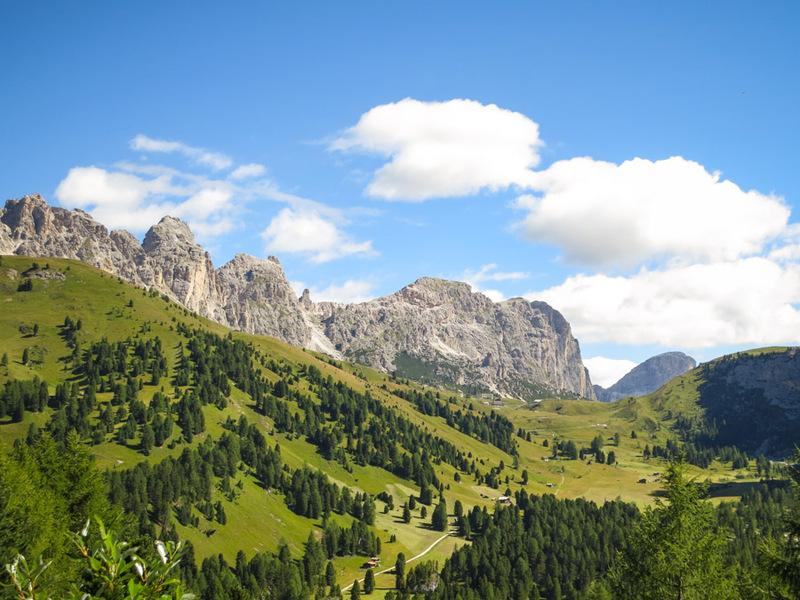 You may encounter many cyclists here packing away their jackets after the descent and getting ready to climb the Sella or the Pordoi, depending on their descent. On the left side of the road you’ll notice a water fountain where you can fill your empty bidons. The top of Passo Pordoi, where you can see a monument dedicated to Fausto Coppi on the left side of the road near the gondola station. The Passo Pordoi descent is over here, but the road will continue to descend as you head towards Pieve di Livinallongo or, in alternative, you can follow the signs to Cortina d’Ampezzo. In Arabba, near the church, there is another water fountain where you can fill your empty bidons. You may have noticed that the Passo Falzarego climb began 1 km earlier before reaching this point. This is also the crossroads for those who would like to climb Passo Giau from its most difficult side. Luckily, we’re skipping the Giau on this loop, so turn left to climb the Passo Falzarego and Valparola – it’s actually one pass, but it’s nice to say that there are two! Left side of the road, a really fresh water fountain for the thirsty ones. The top of Passo Falzarego. But, the work-out isn’t over! Time to turn left and give it all you’ve got to make it up the last steep incline to Passo Valparola! It was short but painful for your legs, right? 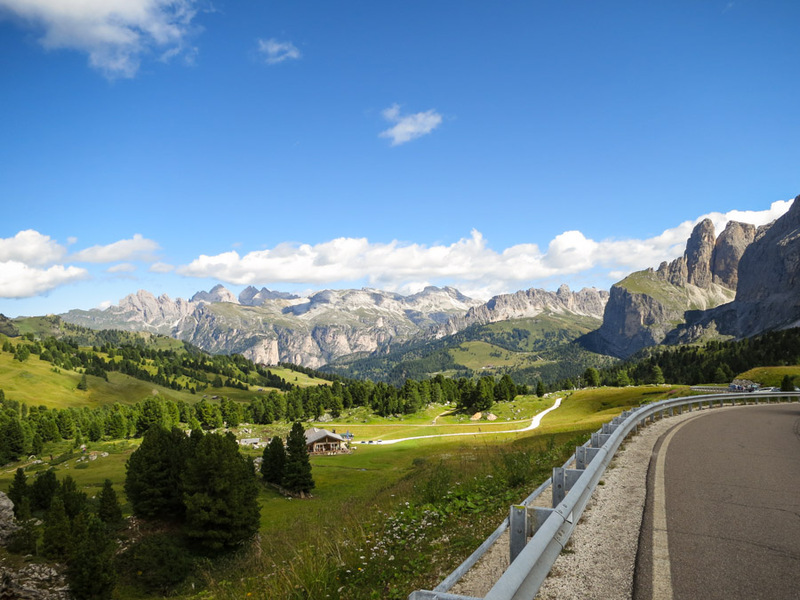 Now you can enjoy the beautiful view of the Val Badia and, if you ride a bit further, you can see the Passo Valparola hut at the end, the Conturines Mountains on the right and the Pütia Mountain (where the Passo delle Erbe climb finishes) in the distance. If there are any Sylvester Stallone fans among our readers, they will probably recognize the exact same landscape in the opening scene of the movie Cliffhanger that was shot in the Dolomites. Finally, it’s time to enjoy a long descent through the towns of San Cassiano and La Villa, where you turn right and head to Badia, the starting point of the day. Welcome back! We hope you had a nice ride! Did you ride the loop we suggested here? What were your thoughts and feelings about it?